This is a fresh 12" from Innersoul out of Harlem, on Mix-It-Up Records. 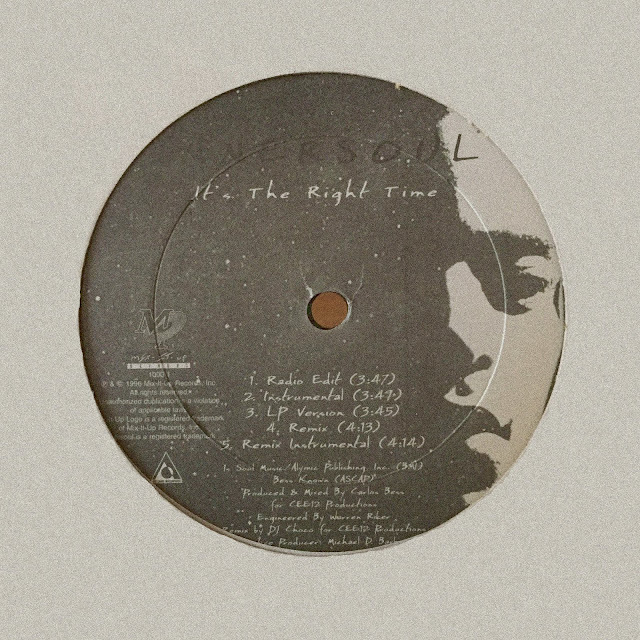 In June of '96, Billboard magazine reviewed ‘It’s The Right Time’ saying: ‘Innersoul, aka newcomer Chris Sawyer, sets himself as a source of positivity on this call for the rise of youth education and empowerment. Wise and clever rhymes are woven into a musical fabric that wriggles with retro-funk rhythm and atmospheric, jazz-spiked keyboards. DJ Choco steps forward with a remix that has a raw street-flavor needed to connect with its intended audience of kids and rap purists. And for the rest who just who something smart and catchy, stick with Carlos Bess’ tight original production. A cool introduction to a rapper with the juice to go the full distance.’ The song is featured on Innersoul’s debut ‘The Theory,’ a gem I recommend diggin' up. You can listen to the full 12" below.